If you enjoy telling a story, recording history and showing your creative side, becoming a photographer might be an ideal career move for you. With the correct training, you can choose from a range of specialties within photography. For a photographer, no two days are the same. Photographers have a mastery of technical details and use their creativity in determining the composition of photos. Depending on whether you work for yourself or in a commercial setting, you’ll also be a marketing and advertising specialist, the Bureau of Labor Statistics says. Photographers maintain a portfolio of their work – often a Web site – to show prospective clients. Among the specializations available are portrait, university, fine arts, news, scientific/medical, aerial and commercial/industrial photography. Flexibility is an important quality because of the variation in client needs and in work environment. As a wedding or a holiday photographer, expect to work long hours at certain times. While many photographers take photos in studios, others work in private homes, corporate offices, shopping malls or even in a war zone when covering the news. Your work site might a helicopter. You’ll need physical endurance to carry heavy equipment and to stand or walk for extended periods. You’ll also need to be able to use a variety of equipment. An eye for composition, artistic ability and knowledge of how to enhance images are important. Computer skills are essential for post-production work. Great communication and customer service skills are also requirements. As of 2010, there were 139,500 photographer jobs, the BLS reports. The agency expects that number to grow by 17,500 by 2020, representing a 13 percent, or average, growth rate. For self-employed photographers, the rate is 15 percent. The difference is due largely to part-time and seasonal opportunities available to self-employed photographers. Several factors could inhibit job growth. One is continuing improvements in digital technology that allow hobbyists to produce quality work. However, businesses will continue to need your services to market their products. In 2010, median pay of a photographer was $29,130, which is $14.00 an hour. Nearly two of every three photographers reported being self-employed that year. When it comes to credentials for a photographer, a portfolio says it all. While some photographers have degrees in fine arts, the background of many includes a combination or working with experienced photographers and taking individual courses from technical schools or colleges in equipment, techniques and processes. Some art schools offer training in composition and design. Business courses such as accounting are important for self-employment. If your ideal is working for National Geographic, however, you’ll need a college degree in any of a variety of disciplines, but it must include photo courses. Typical college majors for its photographers include journalism, fine arts, sciences, anthropology, psychology and sociology. The publisher offers a photography apprenticeship each year. 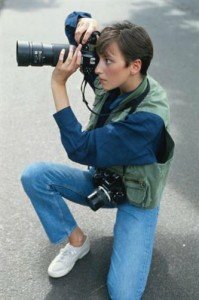 Many photographers begin their careers in an informal apprenticeship, working as a professional photographer’s assistant. As your responsibility increases, you’ll build a continually evolving work portfolio. The portfolio is an essential tool for attracting new work. Think of it as a resumé. To keep up with technology, take advantage of continuing education. The National Press Photographers Association offers both on-site training and online education to increase your proficiency. You might also find earning the Certified Professional Photographer designation helpful for advancement or attracting clients. This credential is available from the Professional Photographers of America after passing an exam and a review of your work.